This article is about the American football coach. For the railroad expert and writer, see Walter Mason Camp. For other uses, see Walter Camp (disambiguation). Walter Chauncey Camp (April 7, 1859 – March 14, 1925) was an American football player, coach, and sports writer known as the "Father of American Football". Among a long list of inventions, he created the sport's line of scrimmage and the system of downs. With John Heisman, Amos Alonzo Stagg, Pop Warner, Fielding H. Yost, and George Halas, Camp was one of the most accomplished persons in the early history of American football. He attended Yale College, where he played and coached college football. Camp's Yale teams of 1888, 1891, and 1892 have been recognized as national champions. Camp was inducted into the College Football Hall of Fame as a coach in 1951. Camp wrote articles and books on the gridiron and sports in general, annually publishing an "All-American" team. By the time of his death, he had written nearly 30 books and more than 250 magazine articles. He is related to comedian Lee Camp. Camp was born in the city of New Britain, Connecticut, the son of Leverett Camp and Ellen Sophia (Cornwell) Camp. 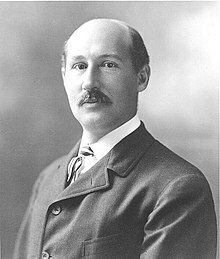 Walter Camp was of English descent. His first immigrant ancestor was the English colonist Nicholas Camp, who came from Essex, England and arrived in colonial New England in 1630, arriving first in Massachusetts and then moving to Connecticut that same year. He attended Hopkins Grammar School in New Haven, entered Yale College in 1875, and graduated in 1880. At Yale he was a member of Delta Kappa Epsilon fraternity, the Linonian Society, and Skull and Bones. He attended Yale Medical School from 1880 to 1883, where his studies were interrupted first by an outbreak of typhoid fever and then by work for the Manhattan Watch Company. In 1873 Camp attended a meeting where representatives from Columbia, Rutgers, Princeton, and Yale universities created the intercollegiate football association (IFA). The representatives created the rule that each team is only allowed 15 plays per drive. Camp played as a halfback at Yale from 1876 to 1882. Harvard player Nathaniel Curtis took one look at Camp, then only 156 pounds, and told Yale captain Gene Baker "You don't mean to let that child play, do you? ... He will get hurt." Camp worked for the New Haven Clock Company beginning in 1883, working his way up to chairman of the board of directors. On June 30, 1888, Camp married Alice Graham Sumner, sister of sociologist William Graham Sumner. They had two children: Walter Camp, Jr. (born 1891), who attended Yale as well and was elected as a member of Scroll and Key in 1912, and Janet Camp Troxell (born 1897). Camp served as the head football coach at Yale from 1888 to 1892 before moving to Stanford University, where he coached in December 1892 and in 1894 and 1895. On 1894 Chicazo Stagg's Chicago Maroons organized an early intersectional contest. Camp was on the various collegiate football rules committees that developed the American game from his time as a player at Yale until his death. English rugby football rules at the time required a tackled player, when the ball was "fairly held," to put the ball down immediately for scrummage. Camp proposed at the U.S. College Football 1880 rules convention that the contested scrimmage be replaced with a "line of scrimmage" where the team with the ball started with uncontested possession. This change effectively created the evolution of the modern game of American football from its rugby football origins. He is credited with innovations such as the snap-back from center, the system of downs, and the points system as well as the introduction of the now-standard offensive arrangement of players—a seven-man line and a four-man backfield consisting of a quarterback, two halfbacks, and a fullback. Camp was also responsible for introducing the "safety," the awarding of two points to the defensive side for tackling a ball carrier in his own end zone followed by a free kick by the offense from its own 20-yard line to restart play. This is significant as rugby union has no point value award for this action, but instead awards a scrum to the attacking side five meters from the goal line. Camp as he appears at the National Portrait Gallery in Washington, D.C. In 2011, reviewing Camp's role in the founding of the sport and of the NCAA, Taylor Branch also credited Camp with cutting the number of players on a football team from 15 to 11 and adding measuring lines to the field. However, Branch noted that the revelation in a contemporaneous McClure's magazine story of "Camp's $100,000 slush fund," along with concern about the violence of the growing sport, helped lead to President Theodore Roosevelt's intervention in the sport. The NCAA emerged from the national talks, but worked to Yale's disadvantage relative to rival (and Roosevelt's alma mater) Harvard, according to Branch. Despite having a full-time job at the New Haven Clock Company, a Camp family business, and being an unpaid yet very involved adviser to the Yale football team, Camp wrote articles and books on the gridiron and sports in general. By the time of his death, he had written nearly 30 books and more than 250 magazine articles. His articles appeared in national periodicals such as Harper's Weekly, Collier's, Outing, Outlook, and The Independent, and in juvenile magazines such as St. Nicholas, Youth's Companion, and Boys' Magazine. His stories also appeared in major daily newspapers throughout the United States. He also selected an annual "All-American" team. According to Richard P. Borkowski, "Camp was instrumental, through his extensive writing and lectures in attaching an almost mythical atmosphere of manliness and heroism to the game not previously known in American team sport." By the age of 33, twelve years after graduating from Yale, Walter Camp had already become known as the "Father of Football." In a column in the popular magazine Harper's Weekly, sports columnist Caspar Whitney had applied the nickname; the sobriquet was appropriate because, by 1892, Camp had almost single-handedly fashioned the game of modern American football. The dominance of Ivy League players on Camp's All-America teams led to criticism over the years that his selections were biased against players from the leading Western universities, including Chicago, Michigan, Minnesota, Wisconsin, and Notre Dame. Many selectors picked only Eastern players. For example, Wilton S. Farnsworth's 1910 All-American eleven for the New York Evening Journal was made up of five players from Harvard, two from West Point, and one each from Yale, Princeton, Penn, and Brown. The selectors were typically Eastern writers and former players who attended only games in the East. In December 1910, The Mansfield News, an Ohio newspaper, ran an article headlined: "All-American Teams of East Are Jokes: Critics Who Never Saw Western Teams Play to Name Best in Country -- Forget About Michigan, Minnesota and Illinois." The article noted: "Eastern sporting editors must be devoid of all sense of humor, judging by the way in which they permit their football writers to pick 'All-American' elevens. What man in the lot that have picked 'All-American' elevens this fall, saw a single game outside the North Atlantic States? With a conceit all their own they fail to recognize that the United States reaches more than 200 miles in any direction from New York. ... Suppose an Ohio football writer picked 'All-American' teams. Ohio readers would not stand for it. But apparently the eastern readers will swallow anything." Camp was a proponent of exercise, and not just for the athletes he coached. While working as an adviser to the United States military during World War I, he devised a program to help servicemen become more physically fit. Walter Camp has just developed for the Naval of setting up exercises that seems to fill the bill; a system designed to give a man a running jump start for the serious work of the day. It is called the "daily dozen set-up", meaning thereby twelve very simple exercises. Both the Army and the Navy used Camp's methods. The names of the exercises in the original Daily Dozen, as the whole set became known, were hands, grind, crawl, wave, hips, grate, curl, weave, head, grasp, crouch, and wing. As the name indicates, there were twelve exercises, and they could be completed in about eight minutes. A prolific writer, Camp wrote a book explaining the exercises and extolling their benefits. During the 1920s, a number of newspapers and magazines used the term "Daily Dozen" to refer to exercise in general. Starting in 1921 with the Musical Health Builder record sets, Camp began offering morning setting-up exercises to a wider market. In 1922, the initiative reached the new medium of radio. ^ a b Bishop, LuAnn (18 November 2013). "11 Historic Tidbits About The Game". Yale News. Archived from the original on 2016-03-03. Retrieved 2017-01-24. ^ Des Jardins, Julie (2015). Walter Camp: football and the modern man. New York: Oxford University Press. p. 9. ISBN 9780199925636. Nicholas Camp, his earliest known ancestor, came to Massachusetts and settled in Connecticut in 1630. ^ a b c "Obituary Record of Graduates of Yale University Deceased during the Year 1924–1925" (PDF). Yale University. 1925. pp. 1348–50. Retrieved March 24, 2011. ^ "Camp Curbed the Carnage". Spokane Daily Chronicle. September 8, 1962. ^ "Star-News - Google News Archive Search". google.com. ^ Branch, Taylor, "The Shame of College Sports," The Atlantic, September 14, 2011 (October 2011 issue). In 1905 in McClure's, Henry Beach Needham published two stories, "The College Athlete: His Amateur Code: Its Evasion and Administration." (July; 25:3 p. 260) and "The College Athlete: How Commercialism Is Making Him a Professional" (June; 25:2) with Yale content per "The early history of football at Yale: Contemporary sources" Archived 2012-04-26 at the Wayback Machine, Critical Sport Studies. Retrieved 2011-09-27. ^ Borkowski, Richard P. (1979). The Life and Contributions of Walter Camp to American Football (Thesis). Temple University. ^ a b c "All-American Teams of East Are Jokes: Critics Who Never Saw Western Teams Play to Name Best in Country -- Forget About Michigan, Minnesota and Illinois". The Mansfield News. December 8, 1910. ^ Ross Tenney (December 31, 1922). "Much Dissatisfaction Over Camp's All-American Team: Football Dean Is Accused of Favoring East; Walter Camp Soundly Scored For 'Poorest Teams Ever Foisted Upon Public'". The Des Moines Capital. ^ "Westerners Missed By Walter Camp: Football Wizard Puts Indian on 'All-American.'". The Decatur Review. December 7, 1911. p. 5. ^ Farnsworth, W.S. (1910-12-04). "Picking All-Stars Is No Easy Task: Backfield Men Show Greater Individuality Then Men on the Line and Are More Easily Chosen". The Billings Daily Gazette. ^ "Getting the Radio News by Telephone". Popular Mechanics: 636–638. 1925. "Walter Camp Found All-American Eleven Selections and Originated the Daily Dozen." New York Times, March 15, 1925. p. 1. Wikimedia Commons has media related to Walter Camp. Walter Camp (1912). Condensed auction for the busy man. NY: Platt & Peck.